How Does AR / VR Retail Shopping Work? The retail industry is one of the biggest industries on the planet and a critical element in the backbone of the global economy. It is also the perfect training field for the emerging technologies implementation, making it an ideal place for Virtual and Augmented Realities to show their worth. The reason for such openness is simple - Retail is also one of the most competitive fields of the economy. It is common knowledge that no matter how niche your market might be - you have to fight for the place under the sun, you have to persuade customers. That makes retail business particularly interested in finding new and more elaborate ways of engaging customers and establishing new brands. Retail business needs to be competitive and to be such, it tries every new technology on the block. It is hit and miss but when it hits - it hits hard. Concurrently, this helps to establish new technologies and fit them into the business model. For example, just a decade ago such thing as smartphone notification seemed futuristic and now it is a norm. And that was not in the least because of the many things that were added to the customer experience in online and offline retail. How Does Augmented and Virtual Reality Retail Shopping Work? VR & AR in Retail is becoming more and more popular with giants such as IKEA and Lowe's starting to present the business cases for it. Retail, especially retail's marketing area, seems to be a perfect environment for the Virtual and Augmented Reality solutions implementation. 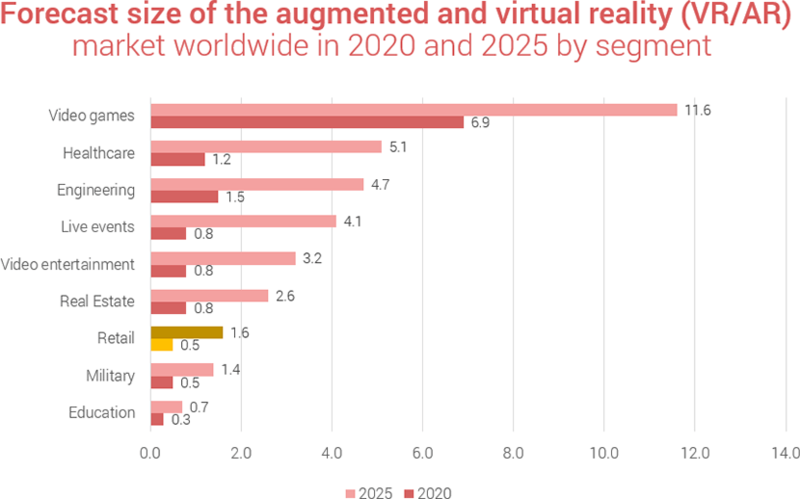 The reason for that is simple - as you know, one of the biggest roadblocks in implementing AR & VR solutions in practically any commercial field is the lack of the proper business model to keep it afloat as a standalone product. In retail, however, the situation is a bit easier. The thing with retail business is that it doesn’t need VR & AR solutions to be profitable, it's the customer experience that matters. It is about building brands associated with quality, care and a wide range of options. Virtual and augmented reality can help to do just that, reshaping the industry to fit the latest trends and stay modern. Also, the demand for both augmented reality and virtual reality shopping already has been created by the marketing specialists and you, as a retail business man or woman, can ride the waves. 55% claim that implementation of augmented reality to the shopping experience makes it more fun. Immersion and Engagement are amongst the prime directives in the retail industry. If you lack in that department - any sell will be a hard one. VR and AR work so well with retail business is that of its ability to solve major problems with customer experience - i.e., lack of engagement and lacking immersion into the product value proposition. If you think about it for a moment - customer experience is an extremely complicated thing that requires a lot of design thought put in to effective. Augmented Reality and Virtual Reality retail shopping can handle these issues by offering an expansion of customer experience into a more interactive and customized way. Add augmented reality and customization for the presentation of a product or comparison of several products, and it all can be additional bonus points that lead to a successful sale. Another strategic advantage that brings the implementation of VR & AR into customer experience is overall simplification and customization of the experience without much of an effort. The thing with VR and especially AR solutions is that they are relatively easy to master in a very short period. As a user, you don’t need to know quantum mechanics to access “Try before you buy” features. The features are always what it says on the tin, and the customer is capable of understanding how to use an app intuitively. You do need a simple onboarding at the very beginning, but if your (or our) UX designers have done an excellent job, your users will enjoy using the app. In-store experience is one of the best areas where AR & VR Solutions can be applied. As one of the elements of customer experience, the in-store experience can use navigation and information features of AR & VR to improve customer experience. As such, AR / VR retail experience can potentially make Retail UX more fulfilling. Let’s take a closer look. In-store navigation is one of the most complicated elements of the customer experience. Sometimes it just can’t be solved physically. However, AR can make it a lot easier. Another exciting AR retail routing solution involves gamification of the customer experience. In this case, the route leads not only to the product but for some gifts or discounts or other pleasant surprises. The most potent way of implementing AR into in-store customer experience is with providing an extended set of product information. You may say that all information that matters is already on the back cover. But not every product manufacturer fits the product information in an understandable manner and not every customer can get to it. Enter AR. The amount of information at the customer’s disposal critically affects their decision making process, i.e., making or not making a purchase, which is where Augmented Reality solutions can help with the data. Augmented Reality Retail can streamline the delivery of the product information and potentially can help customers to navigate within the sea of similar products via comparison by the selected criteria. It can turn the product search into something like a pokemon hunt. The other important thing AR extension can make much simpler is product search. Sure, the system that is active at the current moment is perfectly fine as it is and on the surface, AR seems utterly abundant to it. But on a second glance, AR can streamline the discovery element of the process of finding the right product by toggling the set of configurations. On the other hand, AR retail extension can make a significant impact on the way customization of the product is arranged. It is one thing to know that a phone with a particular color scheme is available and it is an entirely different thing when you can suggest your input and configure some elements of the product to your taste. Sure, many elements depend on the manufacturers, but given the fact that such option can increase sales (albeit in a somewhat gimmicky manner) - it surely can make some manufacturers consider to play up with such possibilities. Home In-Store Experience - "Try Before You Buy"
Augmented Reality is the key to making the in-store experience reality at home. For example, “Try-before-you-buy” concept is tailor-made for it, and the same thing can be said about immersive interactive product catalogs. Try-before-you-buy ”option is perfect for both VR & AR solutions. It is one of the things that are always in demand, and the implementation of such technologies will make it more efficient and effective. The reason why this feature can benefit from VR & AR extensions is simple - people want to be sure that they have chosen the right product in the proper configuration. Trying out is the easiest way to make it sure but it's not always possible to make it in [real] reality. Such applications can be applied literally to any product that needs to fitted or otherwise experienced. The most obvious types of VR/AR Try-Before-You-Buy are related to clothes, makeup, housing, and furniture fitting. Finding the right furniture to fit in the room is a challenge sometimes. You have to find a perfect match and hope that it all will fit. In the old days it was a hit or miss affair, but now with an implementation of AR, finding and matching in the objects of furniture is almost a non-issue. Over the last couple of years, Amazon and IKEA had implemented diverse systems of “try-before-you-buy” that create accurate 3D impressions of how certain objects will fit into the interior. The things go to a different level when it comes to implementing VR into the mix. VR can make so many housing issues easier. For example, if you are looking for an apartment, you can make a look-through via VR. On the other hand, if the house is under construction or just on a concept stage - you can walk through the 3D proof of concept to experience how it is planned and whether you would like to live there. While both options are an approximation that doesn’t completely negate the necessity of checking the thing out in reality - it is a worthwhile extension of the experience. Clothes and Makeup AR “Try-before-you-buy” option is very different from the furniture version from a conceptual standpoint. The reason for that is simple - unlike furniture fitting which is clumsy and clunky and otherwise complicated, people genuinely enjoy fitting some clothes and trying some make-up for real. It is a part of the shopping experience and as such many of the customers hold it dearly. With that being said, AR recreation of that experience offers one crucial element that is unavailable in the real world - supreme customization. AR extension can bring fitting clothes and trying out new makeup schemes to homes and vastly expand the variety of options. It is one thing to fit as many clothes as possible. However, one might get tired or bored from doing that. On the other hand, with AR TBYB, things get a little bit simpler as there is no need for putting on clothes, taking it off and so forth. All you need to do is to choose an option, see if it fits all right, make a purchase or swipe to the next product. The product catalog is one of the most essential elements of off-site retail activity. As such it can benefit from the implementation of the Augmented Reality solutions. For instance, one of the more significant problems with product catalog is insufficient or overly vague product information. With AR, this information can be expanded in the pop-up cards with all the vital information. Another feature that can be implemented into the product catalog is “Try Before You Buy." Also, AR can fit into the catalog a demonstration of the product in action in the form of interactive scenario. The other variation of immersive product catalog is fully operational Virtual Reality retail store where a digital avatar of the user can try on new clothes or experience different products. While compared with the AR retail apps, the practical element is lacking at the moment - in the future VR Retail Stores might establish itself for certain types of products. At the APP Solutions, we think the reality as we know it has been dramatically changed and will experience even more changes in the future. It is not something to be feared, but rather, something that we should embrace and take advantage of. VR Shopping - we think that this is an excellent opportunity to use because it opens up so many possibilities. Just consider people who are limited in mobility - they often have to either ask someone to get them something or come up with creative ways how to get to the store (while you are losing a whole segment of potential customers). VR experience cannot only overcome physical obstacles but also give the customers a chance to enjoy shopping as many other people do. The most exciting part of the implementation of VR & AR in Retail Business is the fact that these technologies offer an entirely new dimension to work with. Sure, both technologies at the moment are barely extending and expanding the traditional services in a variety of ways. But that’s just the beginning for AR and VR in Retail. Who knows what kind of services VR & AR will offer for Retail Commerce in the future? The only thing for sure is that the best is yet to come. Would you like an AR or VR Store App?